Divorce can make someone feel that their life can never be right again. Where is God? Could he possibly understand? Would he even want to lead me through this? And why has this happened to me? 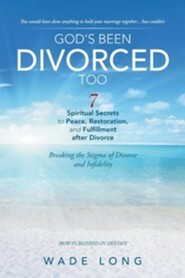 God's Been Divorced Too provides a Christian answer to those questions. 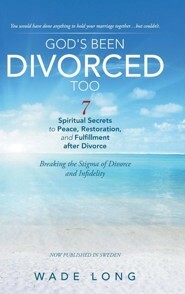 The fact that God himself has been divorced is utilized to break the usually powerful stigma associated with divorce. God's personal divorce is also used to delve into the dynamics of infidelity, for the specific purpose of removing the disorientation that always seems to follow a betrayal. A framework of “Seven Spiritual Secrets” is used to display timeless truths, to both understand the past and to build a new future. The seven secrets of freedom, peace, reciprocity, fallenness, integrity, trust, and fulfillment will take the reader on a specifically scriptural journey into restoration after divorce. Many people, from ancient times until today, have embraced the truth of these timeless secrets as they walked through the pathways of their lives. So come and join them! It's the scriptural journey of peace, restoration, and fulfillment. 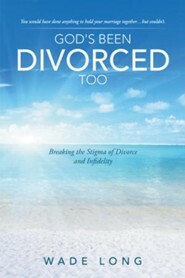 I'm the author/artist and I want to review God's Been Divorced Too: Breaking the Stigma of Divorce and Infidelity.